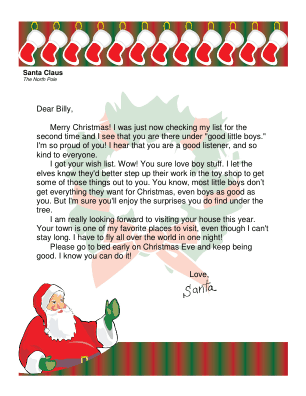 This printable letter from Santa to a little boy mentions how proud Santa is and acknowledges receipt of the boy's wish list. Merry Christmas! I was just now checking my list for the second time and I see that you are there under "good little boys." I'm so proud of you! I hear that you are a good listener, and so kind to everyone. I got your wish list. Wow! You sure love boy stuff. I let the elves know they'd better step up their work in the toy shop to get some of those things out to you. You know, most little boys don't get everything they want for Christmas, even boys as good as you. But I'm sure you'll enjoy the surprises you do find under the tree. I am really looking forward to visiting your house this year. Your town is one of my favorite places to visit, even though I can't stay long. I have to fly all over the world in one night! Please go to bed early on Christmas Eve and keep being good. I know you can do it!